Hello Awesome, Creative Beings!!!! I am so happy to see you back for another year of LET’S FACE IT! Last year, we came together for our very first year of focusing on faces and portraits. I was so thrilled by the response to the course that I just knew we had to have another go! So, here we are, back for more! For LET’S FACE IT 2017, I have put together a ridiculously awesome, super yummy, fantabulous group of 19 of my favorite mixed media artists. Together, we want to share MORE of our strategies, tips, and techniques that we use in order to create our faces and portraits so that you can continue on this path of creating beautiful, creative portraits! I know from my own personal experience just how intimidating it can be to draw/create faces and portraits. In fact, at one point, I was so scared by the process that I quit creating for years! After connecting with others via Facebook and art workshops, I found that I was not alone, and this concept of a year of creating portraits began to brew in my mind! Let’s Face It started last year in 2016, and we have 900+ students to date with people still signing up! We have created a community of encouraging artists that want to work together to overcome these fears and support one another along the way! 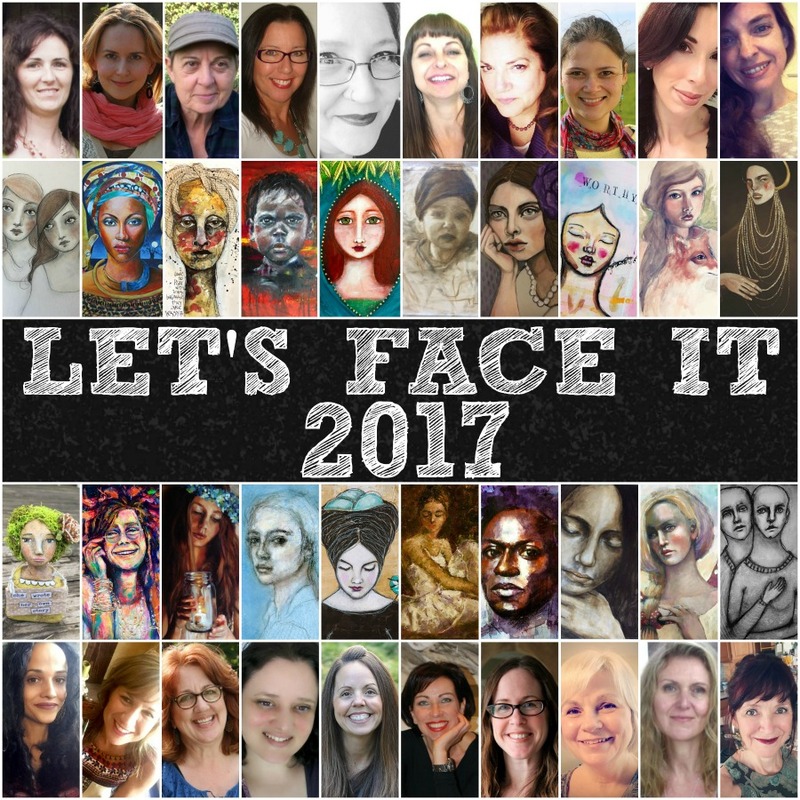 LET’S FACE IT 2017 is a course for anyone that wants to practice creating faces and portraits, but was especially designed for those of you that have felt scared or intimidated to do so at some point in your life. This course will be a safe place for you to continue to practice your skills and receive feedback from other artists and learners along the way. The weekly lessons will give you the instruction you need to learn how to construct a face in different positions. You will learn specifically how to draw a face/portrait, and then how to use different materials to complete your portraits. We will use media such as paints, pencils, pastels and more!!! As we progress through the course, the various instructors will be teaching you their techniques and strategies that they use as they create in their particular style. The course is set up in this fashion so that you get tons of practice in different areas. You will also continue to receive weekly Tips and Tricks with Kara, BUT this year, the guest teachers will also offer their own tips and tricks!! Additionally, you will receive weekly journal prompts to give you ideas and inspiration for regular practice. Below is a sample “Tips and Tricks” video from Let’s Face It 2016. What is really special about LET’S FACE IT is that it is full of various talented artists, each with their own unique style. You will see that some artists have a more realistic style, and others are more whimsical. Each artist has worked very hard to find her style when it comes to creating her face and a bit of that journey will be shared with you in hopes of inspiring you to find “your face”. My hope for Let’s Face It – 2017 is to bring you back for more inspiration to help you continue on your personal journey of discovery and growth as you continue to develop you own unique style of painting portraits. It is not necessary to take Let’s Face It 2016 prior to 2017. However, if you are interested in taking 2016 as well, you can find it here. Here is your super-duper, delicious, “out-of-this-world” group of instructors that I know you will not be able to pass up! Click on the names below to learn more about each artist! Can you believe this amazing line up???!!?!? Pinch yourself, because it is real!!! So, what is included with this course? 50 weeks of amazing stuff! Each week you will receive a BRAND NEW lesson that has never been seen before! While these lessons are all new, some of the techniques might be ones that you are familiar with. Some of the lessons will be full-length videos from the instructors that walk you step-by-step through their creative process in creating faces/portraits. Other lessons will be mini lessons, PDFs, etc. that share special tips and strategies to use as you are creating. Typically we will be rotating between a full-length and a special technique lesson. This way you will have about two weeks in between the longer lessons. 10+ lessons from your host, ME, Kara Bullock! My lessons will include both full-length and mini! Suggested supply list when registration opens! Step-by-step PDF instructions to go along with the main lessons. These will be printable and you can use them to follow along with the lessons. Downloadable content that you can keep forever, including the videos!! All videos will be downloadable! Whoo Hoo!!! A Facebook group dedicated to those of you taking the course and your teachers! Personal time with me. I will have specific times each week that I am available in the Facebook group. Yay! 19 awesome art teachers plus your hostess (ME), 50+ weeks of lessons, PLUS other goodies!! ***Get more bang for your buck by buying some of the very special packages below! You can purchase Let’s Face It 2017 on it’s own, or purchase a package deal. These will be available for purchase on October 10th. See offers below! This purchase will include access for one to Let’s Face It 2017. Course access information will be sent immediately upon completion of payment. Cost $125. Early Bird price is $99. This purchase will include access for one to Let’s Face It 2017 PLUS access to the Let’s Face It 2016 – Kara ONLY (self-study). Course access information will be sent immediately upon completion of payment. The Let’s Face it 2016 – Kara ONLY, will only include the lessons taught by Kara in LFI2016. Cost $170. Early Bird price is $140. Upon check out in the messages, please comment on which course you would like. Cost $165. Early Bird price is $135. Need a payment Plan? No Problem! This purchase will include access for one person to Let’s Face It 2017. The purchase will include three installments of $35. You will be set up for automatic billing and upon the third payment, billing will end. Anne Whitlock, -“As an Art Teacher in Women’s Development & Empowerment I cannot recommend Kara’s Classes in her Let’s Face it Program enough. I joined her classes for my down time, to sit, create and join art classes with Women online as I live in a remote area in Nepal and do not have much one on one opportunity for a live class. Kara is an open, caring teacher who shares her art knowledge with a full heart. It is obvious to all she is passionate about the subject she teaches and the people in her art community. She excels at joining many teachers around the world with the Let’s Face it community so the weekly lessons are always an exciting surprise of what is entering your inbox this week to create! Ellen Goodloe, CA – “I want to say how pleased I am with Let’s Face It. This class has been transformational for my art. But more than that, the community of artists you have built is incredibly diverse, talented and supportive. This is probably the best class experience ever. I love how there is so much variety in style and approach with the mix of teachers. Such an incredible value – so many quality teachers, the variety, a new lesson each week. I love the format – alternating mini and main lessons, varying the styles and teacher, the tips and tricks. Again, I can’t even begin to speak to the value. Plus, you are absolutely adorable. I love how real and open you are…and, you get verklempt and cry. I just love that. Lori Badstein, – “I am so happy I decided to take this course. It has been truly amazing! The line up of teachers is totally awe inspiring! Each teacher has spent so much time on their lesson. The lessons are clear and concise. They provide quality instruction and they provide so much support in the Facebook group. I am relatively new to the art world and was worried that the lessons would be too advanced for me. I have always been fascinated with drawing faces but needed some help. This was the perfect class for me! The support is incredible from the teachers and fellow classmates. The lessons are developed so everyone can participate. I just can not say enough about the incredible quality of this course. Kara has done an incredible job at putting together amazing artists that are willing to take time to share their knowledge. I have taken many classes and this by far has been the best! We are so excited and sure hope you will join us for a year of connecting, creating, and collaborating with other creatives like you!